As a parent we often focus on getting through the school year and seldom have the time to ponder what happens after graduation. At BNI we have a program that supports young adults as they transition from school life to workforce life – Transitional Work Services (TWS). I was especially honored today to receive an award from the TWS team for my efforts to promote the program through television and social media. 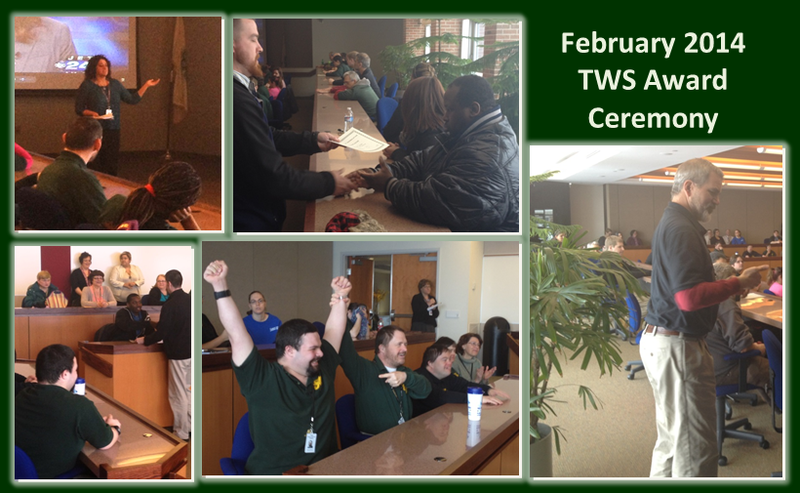 Each month TWS hosts an awards ceremony to recognize those individuals who are excelling in TWS, those who are now working in the community, and those with perfect attendance. Local businesses including Erie Insurance Arena, Millcreek Mall, Tim Horton and Bello’s were a few recognized for hiring in the past month 15 graduates of TWS for their workforce. In accepting the award I suggested that I’d prefer to honor all the young men and women who are participating in TWS. They are my heroes! One of the awardees for perfect attendance is Geoff Gloekler. As a preschool student he attended our school, graduated and then moved onto the Erie School District through high school. He returned to TWS and today is a role model for his peers. Geoff told me that he loves working and really enjoys cleaning. When asked what his favorite job was Geoff immediately responded cleaning bathrooms. I applaud Geoff Gloekler, our TWS participants, their supervisors and job coaches. If you know of a local business who may be interested in hiring our TWS graduates feel free to contact me. You too can make a difference in the life of a person with a disability. To find adult training programs and services in your area please visit Autism Speaks. This entry was posted in Uncategorized and tagged autism, Bello's, bni, ELBS, employment, Erie Insurance Arena, hire, hiring a person with disabilities, individuals with intellectual disabilities in the workforce, intellectual disabilities, job, jobs, millcreek mall, school, Tim Horton, Transitional Work Services, TWS, workforce. Bookmark the permalink.